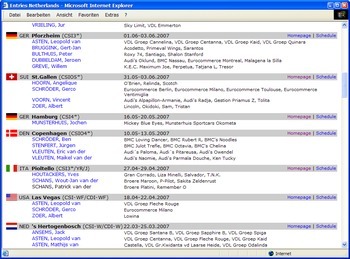 After logging into HippoBase, national federations can see a list of upcoming and past events with some essential details. For an event to appear in that list an organizer must add the respective country to a least one "entry group" of their event and then put the country "online", i.e. invite the national federation. The configuration of the organizing committee should also include information on entry deadlines, a contact for entry issues and a link to the schedule(s). Before a national federation can start working on the entries of an event it must complete the "CheckIn" procedure and leave the name, phone and email of a contact person. By default, this data is inserted automatically from the currently active NF user account. A competitor can be added from the archive with only a few mouse clicks. Depending on the nature of the event and the invitation rules, the organizing committee can either add a selection of invited riders or let the national federation add their choice. Just like competitors, horses can be added from the archive with only a few mouse clicks. Most competitors offer a preselection of horses which have been used at previous events. 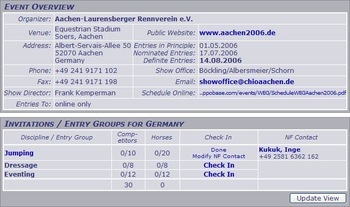 A search by horse name, competitor name or FEI passport number is also available to find horses within the entire archive. When adding a horse from a different competitor, national federations should not forget that the owner might have changed as well. 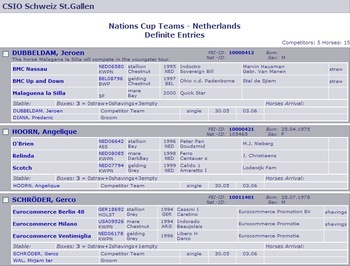 To keep control of the data in the national archive, an independant copy of competitor and horse data is made for each event, i.e. an organizing committee can not directly modify the data in the national archive. However at the end of an event, the Equinis staff scans the master list for changes made during an event and semi-automatically copies all sensible looking modifications and additions to the national archives. This way, the staff of national federations and the show office staff contribute to the completeness of the database. Unlike traditional entries on paper, HippoBase does not send a "nominated" and "definite" version of the entries from the national federation to the organizer. The entry records in HippoBase always remain the same but the selection of the nominated entries is usually reduced for the definite entries. The three classical entry stages "entry in principal", "nominated entries" and "definite entries" can be described by which of the actions "add", "remove" and "modify" are still allowed. To clarify the actions still possible for the user of a national federation HippoBase uses these actions separately for competitors and horses to describe the entry phase. For example, once the nominated entries of a championship have been submitted existing riders and horses can only be removed or details can be modified on existing records. The six resulting "rights" of a national federation are represented by checkboxes. Once a national federation has finished something which is unlikely to change they can show the organizer this by disabling the respective right. After the change has been submitted the checkbox can only be re-enabled by the organizer. The buttons "Nominated Entries" and "Definite Entries" are merely shortcuts to trigger certain typical configurations of the checkboxes. In any case, it is the responsibility of the national federation to check all entry data for correctness and completeness before declaring it to be definite. In addition to the "sports data" of riders and horses, event organizers might ask national federations to enter accommodation needs or competitor companions directly into HippoBase. HippoBase tries to remember competitor companions including their pictures for use at a later show. Also box reservations with straw or shavings as well as the assignment of a horse to a certain "tour" (speed/derby/youngster/etc...) can be made online. To make better use of the competitors and horses already stored in HippoBase, Equinis will offer the possibility to use this data for any international event. 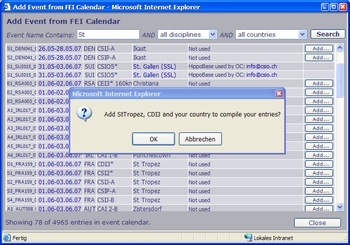 A user from a national federation can choose an event from the FEI calendar and then add riders and horses to it to compose his entries. A Microsoft Word document or an email text can be generated from the entries to be send to an event. To get an overview of all entries in a certain period, the entries of events using HippoBase can be listed seamlessly together with those events not using HippoBase. A report in the design of the national federations website can be used to publish upcomping and recent entries. This will allow interested national federations to manage all their international entries in a uniform fashion and with a distributed team from anywhere on the internet.